Snowcats prowl the base of Buttermilk Tuesday to prepare the super pipe and the massive jump used for the Winter X Games. Preparations for the Winter X Games were slow out of the gate because of warm temperatures and lack of natural snow but now activity is at a fever pitch at the base of Buttermilk. 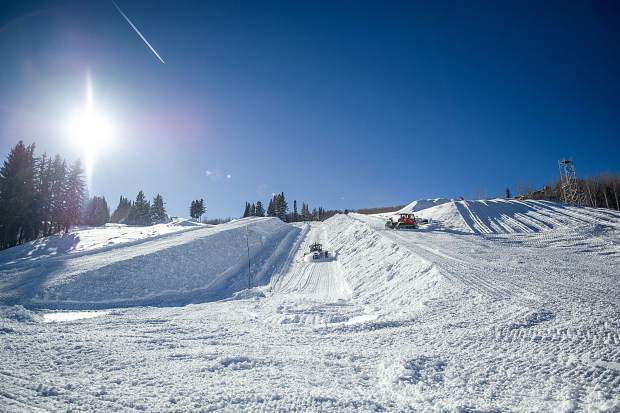 Crews for Aspen Skiing Co. and a contractor for Winter X Games host ESPN are compressing snow and slowly building the super pipe — which is the eye-catching, signature feature for the event — and other courses that will be used for the Games. Work on the pipe started about 10 days later than usual, but the delay won’t have any effect on getting it ready in time for the X Games, said Buttermilk Mountain Manager Susan Cross via email. She said work started as usual in mid-November, then stalled because of the weather. The work is behind compared to last year, but there is plenty of time to make up the deficit before the Winter X Games, Cross said. Frigid nighttime temperatures have allowed consistent snowmaking during the past two weeks. It also helped that Buttermilk scored about a foot of powder from the storm that hit Dec. 16-17. Nevertheless, it was looking hairy for a while into December with brown grass poking through the sparse snow cover at the site of the super pipe. The Winter X Games will be held Jan. 26-29, with all events at Buttermilk. The situation this season wasn’t all that different from 2014-15, when a warm spell prohibited Skico from making snow at Buttermilk from Nov. 29 through Dec. 14. The preparations got compressed into a short period, but without any detrimental effects. Snowcats could be seen prowling the interior of the pipe Wednesday as well as building up the sides of the monumental feature. Once completed, it will be about 570 feet long, 70 feet wide and 22 feet tall. Skico’s terrain park crew, as well as craftsmen from Snow Park Technologies of Reno, Nevada, build the awesome feature. It takes between 350 and 400 snowcat hours to build. Getting the super pipe ready for the holidays hordes is a bigger challenge than prepping the features for the late-January Winter X Games. Cross said the focus is to get the pipe opened for guests during the week of Christmas. Skico logs some of its busiest days of the season between Christmas and New Year’s Day. The super pipe is a huge draw and is rated among the best in the nation in surveys by TransWorld Snowboarding and Freeskier magazines.